We offer a variety of units in all sizes at our self storage facility with our smallest unit measuring 5 feet by 5 feet and our largest unit measuring 10 feet by 30 feet. All of our units are drive-up accessible, so you won't need to haul your items far to get them stored. In addition to your smaller items, we can also store your boat, motorcycle, or RV in our parking spaces. With 24-hour access to your storage unit, you can visit any time of the day or night. Our facility is open six days a week, but if you need assistance when we're closed, our call center is standing by to field your questions. We know how important secure self storage is to our tenants, which is why our perimeter is fenced off. All tenants must use a personalized access code for entry onto the property. If you find yourself needing help hauling an unusually large load, our U-Haul truck rental service will give you the extra space you need. We also offer a variety of items for sale in our office, including boxes and packing supplies like tape. At Springfield Self Storage, we treat all of our tenants' items like they were our own. If you're in Springfield, OH, give us a call today to schedule an appointment for a tour of our self storage facility. 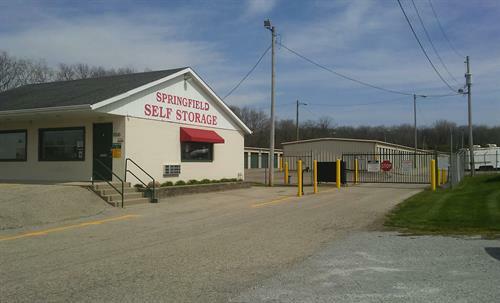 Located south of the Cedar Bog Nature Preserve and a stone's throw from downtown Springfield, Springfield Self Storage is your one-stop shop for self storage services.